So, I thought I had made a big step forward in fitting the Y-Boat recess. However, once I'd epoxyed it in, it didn't look square. I couldn't fathom out what was wrong so it came out. Unfortunately, that was quite a destructive process so save for the flat part of the floor, a total rebuild is needed. This is what's left! While that's ongoing, I've been making the sliding 'bridge' that bridges the gap between the transom door and transom when the door opens. My first plan was to make balsa formers for the underside and then to attach the rubbing strips directly above so not to stress the styrene too much; I've used 0.25mm styrene for the main part and 1.5x3.2mm strips for the rubbing strips. However, the result was very wavey and an attempt at warming in the oven to straighten it out ended in disaster! So, the mark 2 version - pic below, was preshapped but taping the styrene to a spaghetti storage jar and heating in the oven. That worked a treat. The only problem is that the balsa formers stop the piece moving properly as the door opens. So, for the mark 3 version, the rubbing strips were also fixed around the spaghetti jar and heated. Hey presto, it's worked and this is the result. Quite a lot of work for a what appears to be a simple result! I've had a bit of a dilema with the flybridge windscreen. Comparing the windscreen to the full size Padstow boat, the kit part is too wide at the front and the side pieces too short. This is most apparent over the cabin door as the corner of the windscreen matches this part. So, what to do? It wasn't an easy decision as the kit photo etched brass parts are so good otherwise. I was tempted to cut up the kit parts and rebuild it. However, in the end, I decided to fabricate a new frame from plasticard. That would mean I still had the kit parts to fall back on if it all went wrong! So, here's a picture showing the kit parts against the new plastic frame. I then made another inner frame to match the outside frame and also the support brackets. Finally, I needed a way of fixing both inner and outer faces to the cabin roof as this will be done after painting. 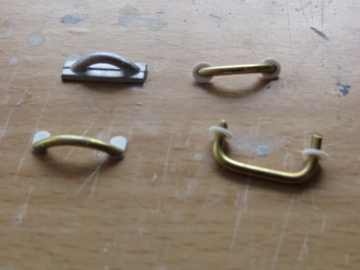 I had considered small brass rod to act as pins having read the Model Boats magazine review. In the end I used plasticard strips so I had a straight edge. 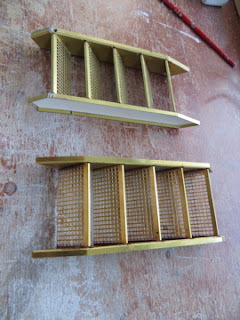 Hopefully the photo shows what I mean; the tray has the dummy bolts heads for the frame and there's about 100 of them. This time I've been making controls for the wheelhouse and the flying bridge. I've made the steering control, new throttle levers and the SIMS control. The steering controls are on the helm and cox's seat and also to the port of the flying bridge. 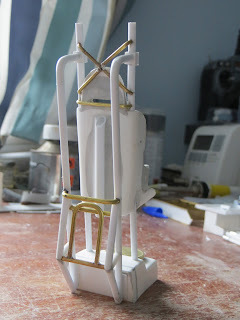 The body is 3.2mm and 4.8mm styrene tube and the lever 0.8mm and 1.6mm brass/alloy. As there are more throttle controls than supplied in the kit, I made a new set so that they are uniform. 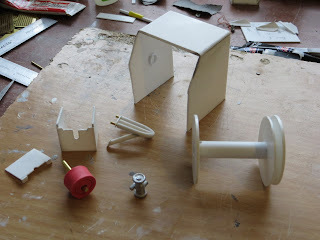 The body is laminated discs of styrene made using my punch tool, through which is a 1.6mm alloy tube. The throttle levers are dressmakers pins. 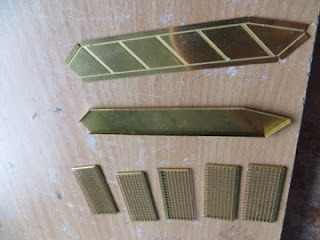 These are on the helm and cox's seats and on both sides of the flying bridge. The SIMS controls are 2 pieces of 3.2x6.4mm styrene glued together then cut and sanded to shape. The trackballs are dressmakers pins. These go on the Helm, Cox, Mechanic and 1st Navigator's seats with a 5th on the 2nd Navigator's table. Now, just to paint them. This time it's the turn of the stairs. 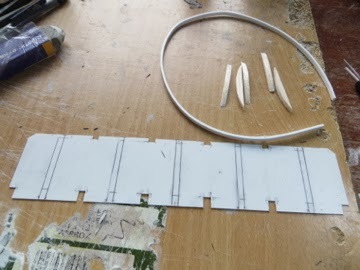 Model Slipway have been excellent in supplying a few extra bits and pices for my build and allowed me to buy extra bits and pieces without having to buy whole photo etched frets. That's allowed me to get a second set of steps back down into the cabin. Is used my etch-mate tool to fold the steps though it was harder than I expected. Due the shape of the outside pieces, I used a combination of the etch-mate and a pair of long pliers. 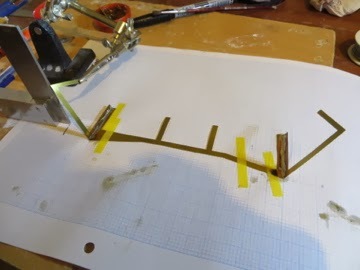 The pieces we re then soldered together by soldering all steps to one of the outside pieces first using a square to make sure all were, well, square! The other pieces was then soldered on. The photo below shows both sets of stairs finished. One set has 0.5 styrene inserts on each side. This was used to join the bottom step back on that I'd previously cut off. 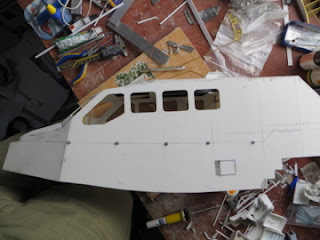 This was originally cut off to fit the cabin as per the kit design. However, as I wrote in my 11 & 28 January '13 posts, I dropped the cabin floor. Luckily, I'd kept the unused bottom step and the pieces of the side parts that I'd cut off. This set will go inside the cabin so the repair shouldn't be too obvious! This time, I've been working on the back of the wheelhouse, trying to finish of the various storage boxes and vent housings that I'd started ages ago. 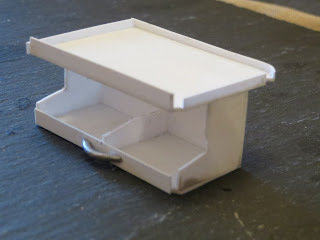 Some of the boxes have warped slightly so I added squares aof styrene inside to sqaure them up. I've made a reel for the tow rope, which will be the appropriate size blind cord added after painting. Small slices or tube were glued inside the box to add as a location of the reel and allow the box and reel to be pained separately. The fire hose box has been slightly modified around the lid and a hose reel added. The hose is heatshrink tube superglued to a 2.4mm brass rod. The 'guard above the hose reel box is 2.4mm styrene tube with 0.5mm styrene strip where it joins the wheelhouse. I've also made backing plates for all of the boxes in this area. 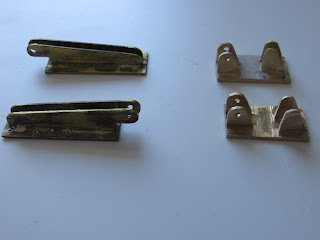 These will be fitted before painting and will hopefully allow the boxes to be painted separately from the wheelhouse but still allowing a positive fix. Anyway, this shows the reel boxes in place; more next time. On the bench this time were the MOB (man overboard cranes). I used the 4mm styrene tube as per the kit instructions and the plans are spot on. As a belt and braces though I used brass rod to pin the parts together. I also made up the retaining brackets which hold the cranes to the side of the cabin when not in use using reference photos. I'm not sure they're 100% accurate but close enough. This is a photo or one crane nearing completion and the parts cut for the other. Although I'm not entirely sure, the cranes appear to have a moving stay behind to secure the crane in position when deployed. I simply glued brass rod to the back of the cranes to replicate this. 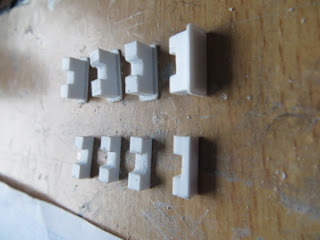 I also glued .25 styrene to the bottom of each pivot bracket. This serves 2 purposes. First it gives a larger and more secure gluing surface for attaching the cranes. Secondly, it makes painting the cranes easier as I won't have to fill the ends of the vertical tube and go can insert brass rod in one end as a handle while painting. 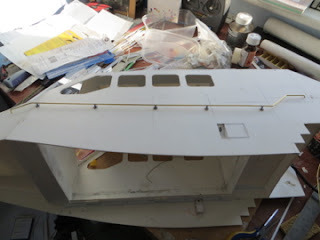 Next job, is the flying bridge and rear of the wheelhouse. My soldering skills have been steadily improving so I decided it was time to tackle the fender basket. I first soldered the sides and base together flat and then bent the completed assembly around a former. Next I soldered the middle and top parts into which the fenders fit. A little filing of some excess solder and hey presto! Next up was the flybridge rail which runs up the starboard side of the step and then to the back of the flybridge. 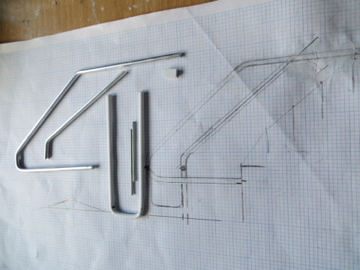 I used some left over aluminium rod for the stair rail so that it could be drilled to pin the pieces together. From my reference photos, I also spotted that the rail is a slightly different shape to the kit plan; the two vertical ends and top rail are all one piece. This meant several attempts were needed to form it into the right shape so several pieces of ali rod ended up in the scrap bin! Hopefully the photos show how it all went together. The rail along the back of the flybridge is styrene tube with brass rod inside. I'm planning to finish off the back of the wheelhouse next. 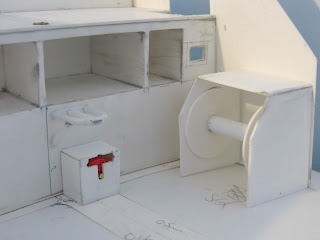 I've continued with the wheelhouse exterior while I steel myself to finish off the crew seats and rest of the interior. First up was the rails along the cabin side. Unlike the Trent, these run along virtually the entire one length. 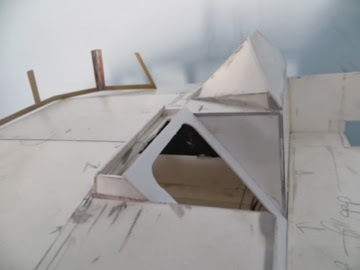 Also unlike the Trent, there are no marks on the cabin sides showing where the bases go. So, I marked up the cabin side using the RNLI and kit plans as a guide. One point to note is that the rail bends upwards about half way along, not much so easy to miss at first glance but enough to be noticable. Also, at least on the Pastow boat, at the front the rail runs closer to the lockers than the kit plans show. 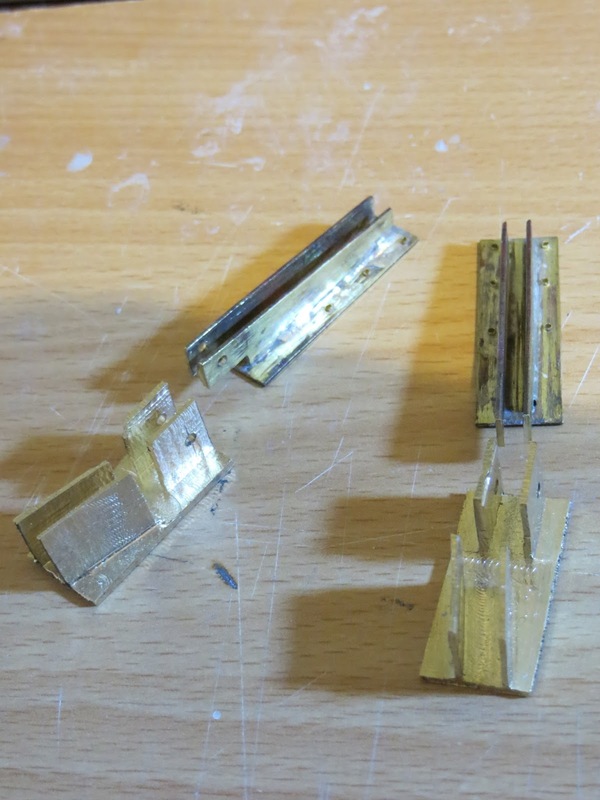 Having marked up the position of the rail and bases, I used the 1.6mm brass rod and soft soldered (low melt solder) this to the bases in situ on the model. I then turned my attention to the safety wire. 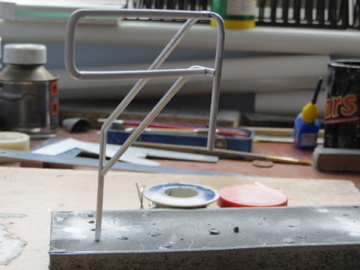 The anchor points will be glued on prior to painting, but as they're fragile, I'll leave that for now. The guides were made from 4.8x3.2 strip in the end. 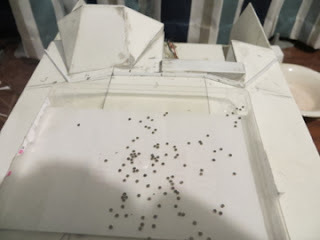 I used 3.2mm square strip at first, as the kit instructions would suggest, but in comparison with the photos and plans I have, these were too shallow. Both are shown below for comparison. I also used 0.5mm strip as a base plate. These are painted orange on some boats, including the Padstow boat, rather than left as wood, so were glued in place. Next up is the stairs and rails I think. I've now turned my attention away from the cabin to the outside of the wheelhouse; I felt I needed a change. First up was the fuel fillers as the production boats seem to have a slightly different arrangement to the kit. 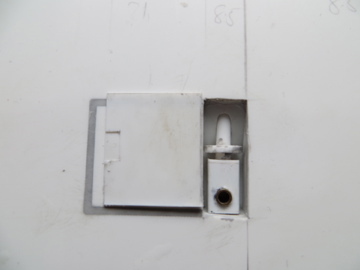 I think, though I may be wrong, that the fuel fillers have a lockable cover on the production boats and the pipe forward of the fuel fillers is a cabin vent. So having cut a much smaller hole and filled the remaining CNC groove, I got started. The filler cover is simply 2 laminated pieces of 0.25mm styrene, one with a notch cut out. The vent pipe is a 3.2mm styrene tube, running into a 6.4mm square styrene tube with the ends capped. The collar is a 7.2mm disc punched from 1.5mm styrene. The vent opening is 3.2mm brass tube. Frankly I'm questioning the sanity of my project to enhance the wheelhouse interior. It feels like I've been doing it for ages! Anyhow, to coin a phrase I've started so I'll finish. This time, I've been working on the framework behind the cox's seat - the front part of the stretcher island. From what I can tell, the rear section is a removable low frame. I started by cutting back the seat base to an angle to match the front part of the seat frame. This is at the same angle as the other seats but runs to the cabin roof. 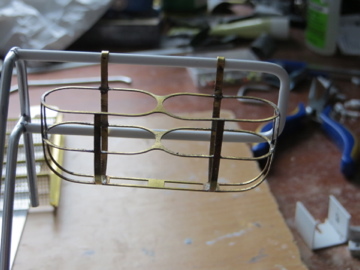 The front of the frame is just 3.2mm styrene tube with square tube towards the top in to which the stretcher frame attaches; though it is braced with 1.6mm brass rod. The frame was then made with 3.2mm styrene, with the braces from 2mm brass. The photos show how it all goes together - the the coin is just to stop the whole assembly toppling backwards. I've not posted for a while because first, work on the Tamar slowed for a while and secondly because my camera broke so I had to get a new one. The reconstruction of the coaming and cabin floor is coming on. The floor is nearly done and the coaming cut down and now needs capping. I was a shame to cut out what was a nice coaming molding but needs must. I've also been carrying on my upgrade of the wheelhouse detail. Work on the seats continues, as does work on the armrest controls for the SIMS system and the throttle and steering controls for the helm and cox's seats. I have though finished the navigator's table, as shown below. 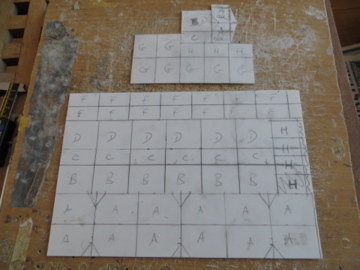 This is a little guess work with the table top measurements taken from the RNLI plans but the rest was guess work from photos. It's probably not 100% accurate but it's a reasonable guess. I've got a chart to go on after painting as well! Next up is the framework behinsd the cox's seat. My production line of seats is taking far longer than I anticipated. 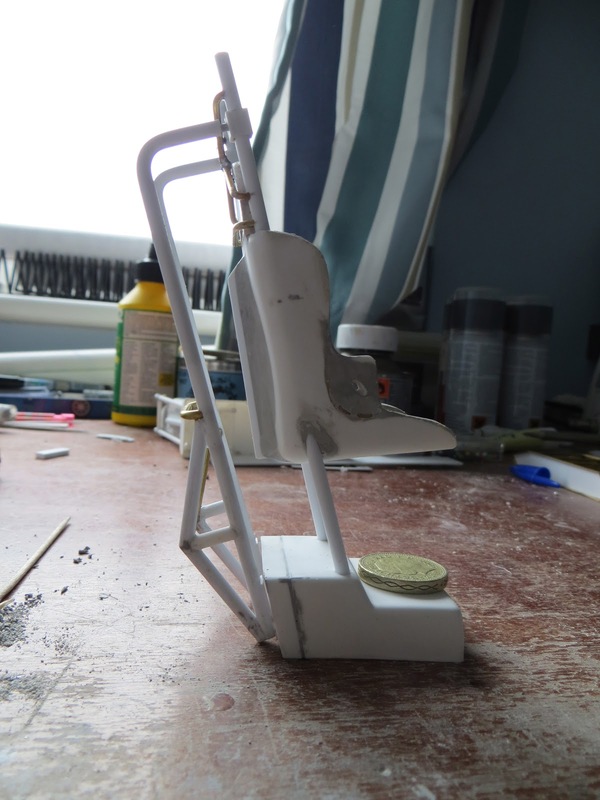 I now have one complete, or nearly complete crew seat and am working on the other 6 but progress is slow. So, to progress, and since the update on my last post, I've butchered the floor former for the cabin. 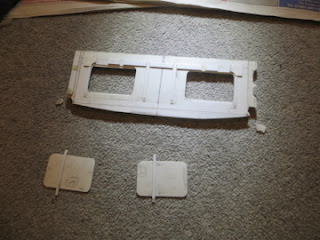 That's involved removing the sides and front with the lock tabs for the cabin floor. I've also cut new pieces to fit and secure the lowered floor. Next stage is the reconstructive surgery to fit the new parts. I've also made the first seat frame which will I think be for the crew seat on the port side at the rear of the cabin. The two forward posts fit through the seats and are 3.2mm tube. 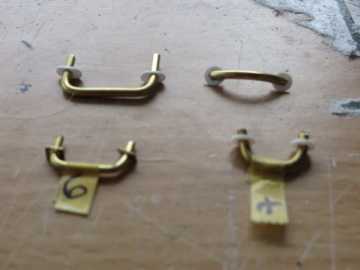 The tops are 4.0mm alloy tube and the side braces are 2.4mm brass. I've used the RNLI plans for the frame size rather than the instructions. All that's left is to finish the shock absorber on the centre seat back. Here's a pic of the (nearly) finished seat. So this post is about the wheelhouse seats. Since buying the kit, I've always thought the vac form seats were a little one dimensional (in the metaphoric sense) or simplistic if you prefer. The windows in the Tamar are also bigger than the Trent so I reckon the seats would be quite visible. I looked at various model car websites in search of racing car seats as replacements but they were pricey and not particularly like the boat seats. So on to plan B. Looking at my reference photos, the seats have a headrest not on the kit parts, the support frame runs through the seat back and there are armrests. Also, the seat belts are blue Sabelt ones which I wanted to add. First, I cut holes in the seat base for the supports which I decided would be better in 3.2mm tube (not 4mm as in the kit). Next, I glued a small piece of 4.8mm (inside diameter 3.2mm) tube at the top of the seats for the support tubes to run through. 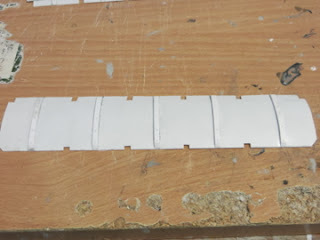 Then I used 1/8" (3.2mm) balsa strip in 1/2" and 1/4" widths for the seat cushions. 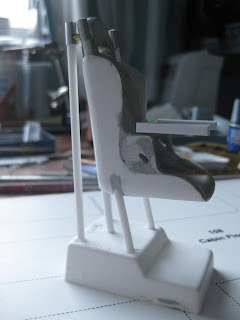 Plasticard was then glued to the back of the balsa on the headrest and arm rest supports - this has two functions: to fit flush to the vac form seat and; stop the balsa splintering when I drill the holes for the seat belts. 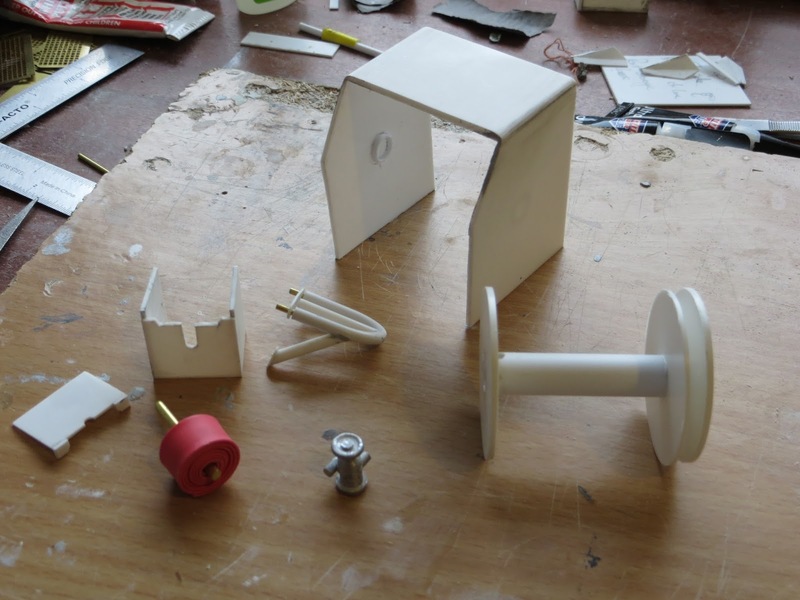 I used Bostik Serious Glue to bond the balsa to the vac form and the plasticard to the balsa. This I had from another project - it's not that cheap and is horrible if you get it on your hands like I did; it won't come off until dry after about 30mins and sticks to anything you touch in the meantime, but it did the job really well. 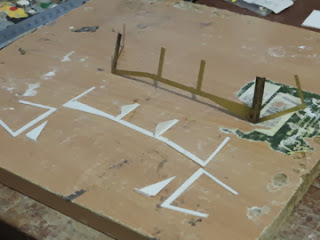 Then I roughly shaped the balsa using abrasive paper and files. Large aps were then filled with Squadron filler as my usual filler of choice Humbrol wouldn't bond to the balsa, though it did work in other places. Next I sanded the cushions to shape and drilled the openingd for theseatbelt holes. 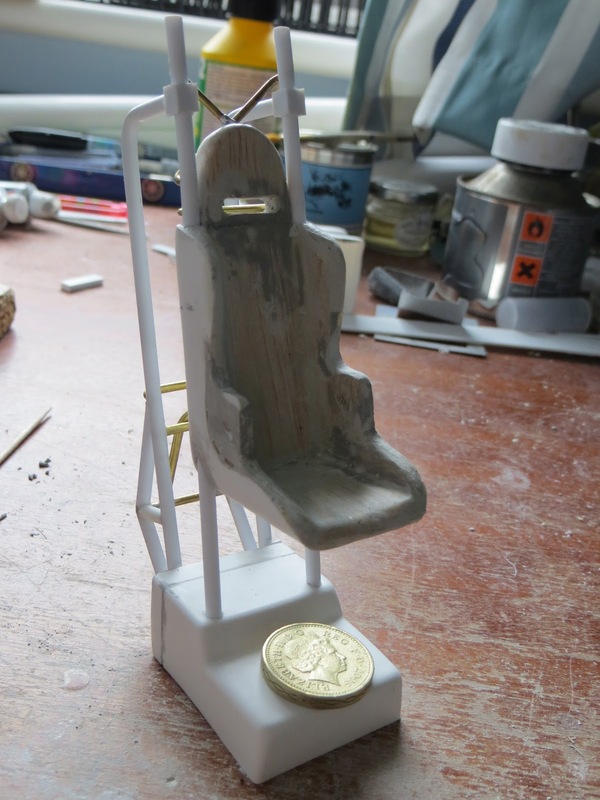 There are 2 more significant parts to add to the seats themselves before moving to the frames and bases. First, the central support will be added from 4.8mm tube and faired into the seatback with filler. I believe this is the shock absorber as there's a spring at the base which I'll be making later. 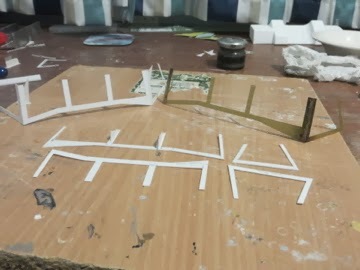 Secondly, I'll be making the armrests, hopefully with the integrated SIMS controls and throttle & steering controls at the appropriate stations. 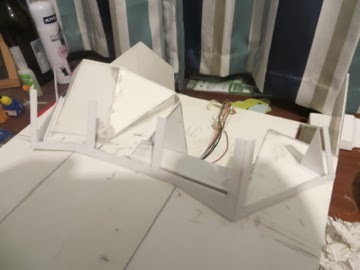 Also, I'll be making the support frames. As the full size seats are carbon fibre, I've yet to decide whether to just paint them black or whether to add carbon fibre decals. This has become a lesson in the law of unintended consequences! I had checked the modified seats would still fit using the plans. 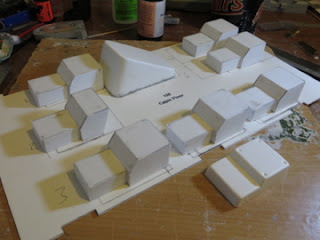 However, I forgot that the plans aren't all to scale so it turns out there's not enough room! So, what to do - it's major surgery time! Not entirely sure how to do it but I'll need to lower the cabin floor and chop down part of the coaming on the deck moulding. At least this will bring the wheelhouse floor to the same level as the deck which is the level shown on the RNLI plans.